Paranoid Pete is a space harvesting action game which was released on the Spectrum way back in 1984. Personal Computer Games advertised the game and clearly you can see that a Commodore 64 version was in the pipeline. TYNESIDE company Ubik’s game Paranoid Pete will not now be appearing in the shops. Weetabix complained that the characters portrayed in the game resembled its own ‘Weetabix men’ used in advertising too closely. 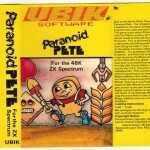 “When we first started work on Paranoid Pete we were working in collusion with Weetabix to produce a game based on their characters,” said Ubik’s marketing director Danielle Allan. “But when the game was complete, Weetabix weren’t happy with the result. “In order to be able to bring out a game ourselves, we changed many aspects of it, but Weetabix were not satisfied and it has now been shelved. So shortly after being released on the shelves, Ubik were ordered to stop selling the game… Was the C64 version even in production when Ubik were told to stop? Rob Hubbard in a video interview once mentioned that he programmed a game which featured the Weetabix character, which the company didn’t get permission to use and hence the game was scrapped. 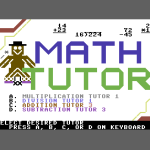 Considering that Rob also coded a game called Razzmatazz, and that Ubik were based in Tyneside … it is pretty much certain that Rob Hubbard was behind the C64 conversion of this game. In which case, it is unlikely that Rob will have the game – as he didn’t keep hold of his tapes/disks from that time. It was confirmed about Rob’s involvement in the game by Chris Abbott in 2015. What is surprising to learn is that the tunes intended for the game have been in out there all along, just not known about their original intention. Tucked away in Final Sample III, the very first tune is the main theme to Paranoid Pete. Song 3 could also be a sub tune as part of the game, Songs 12, 14 and 15 are also believed to be sub tunes used. We may have to find someone from Ubik or another developer who may have something of the game, but it is looking bleak. At the very least, the tunes seem to have been saved! Promising leads and tie ups, but do you know any more on the conversion?